Metsu was born in the influential Dutch town of Leiden, and like several of his contemporaries was an accomplished genre painter. He was trained by another Leiden painter, Gerard Dou (1613 – 1675), who also had Frans van Mieris the Elder (1635 – 1681) as a student. Metsu also trained with Jan Baptist Weenix (1621 – 1660) in Utrecht. 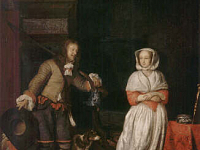 Some of his strongest influences were other Leiden painters such as Jan Steen (1626 – 1679), as seen in Metsu’s piece Lazarus. His influences from Rembrandt (1606 – 1669) and collaborator Jan Lievens (1607 – 1674), are seen in his 1653 work, Woman Taken in Adultery. After training in Utrecht, Metsu relocated to Amsterdam in 1657, where he began to paint some of his finest works, considered amongst the best genre pieces of the period. His portraits were often depictions of middle class life, and taken directly from his surroundings, as a poultry holder and living near a vegetable market, a well known example being, Marketplace of Amsterdam. A wealthy merchant, Jan J. Hinlopen, patronized Metsu, who produced some of his best work in portraits of the Hinlopen family. His works were often considered equal to that of the other great Dutch genre painters, such as his teacher, Gerard Dou, as well as Gerard ter Borch (1617 – 1681) and Pieter de Hooch (1629 – 1684). Metsu’s piece, The Sick Child, implores a rich palette of colors, which is sometimes compared to work of the Dutch master, Johannes Vermeer (1632 – 1675). Metsu’s work is a prime example of the 17th Century’s Dutch Golden Age of painting. He painted a number of genre pieces, still-life works and portraits; many of which are difficult to give an exact date to. Of his work seen in the Uffizi Gallery is, A Lady and a Knight, sometimes called The Hunter and a Woman.